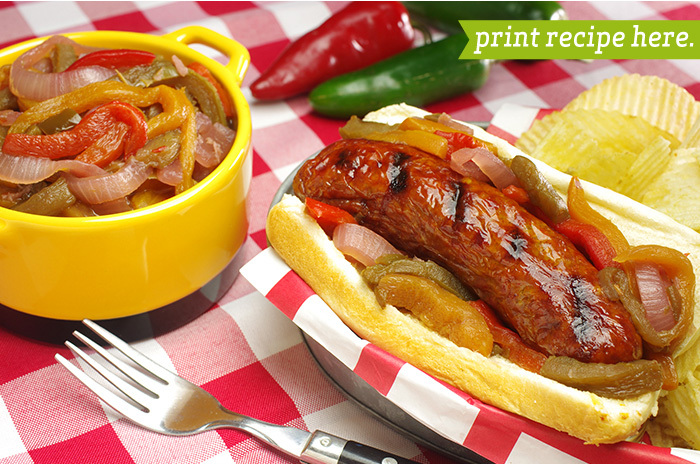 My friend and occasional canning buddy, Sue Moore, runs a hot-dog business called Let’s Be Frank. 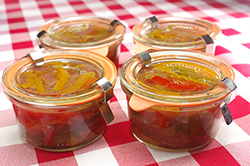 Her Mumbai-spiced Devil Sauce was the inspiration for this more Mediterranean-style pepper relish flavored with red wine and fennel. 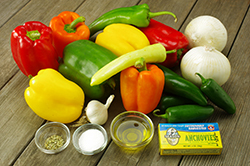 I make it in high summer from a mixed bag of jalapeños and every type of mild pepper I can find: bell peppers, Anaheim green chiles, Hungarian peppers, lipstick pimientos, sweet banana peppers, and Italian long peppers. The devil is in the details. 1. 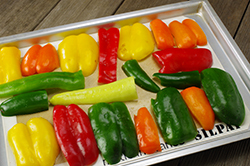 Split the peppers, and jalapeños in half, and lay them, cut side down on a baking sheet lined with aluminum foil. (You’ll probably need to work in two or more batches.) 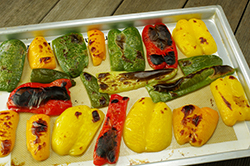 Put the peppers under the broiler and cook until they are thoroughly scorched and their skins blister. 2. 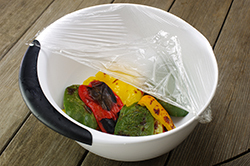 Put the scorched peppers in a covered container, and allow to steam for 15 minutes. Remove the stems, seeds, and skins, which will slip off. Wear rubber gloves when working with the jalapeños. 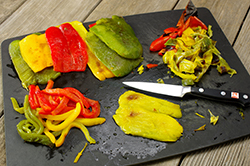 Slice the peeled peppers crosswise into 1/4-inch strips. Dice the jalapeños. Set aside. 3. 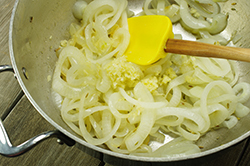 Peel and cut the onions into 1/4-inch slices. Sauté in the olive oil over medium heat, and season with 1/4 teaspoon of the salt. Stir frequently, and don’t let the onions brown. After 5 minutes, add the fennel, minced garlic, and anchovies, and season with another 1/4 teaspoon of the salt. 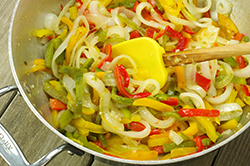 Cook for 5 minutes longer then add the peppers, half the jalapeños, and the remaining salt. Cover with the vinegar and wine, and stir to combine. Bring to a boil, then lower the heat to a simmer and cook, partially covered, for 30 to 40 minutes. Midway through cooking, taste for the heat level, and add as much of the remaining diced jalapeño as you like. 4. 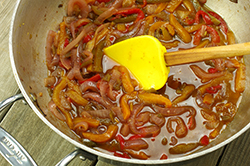 When the liquid has been reduced and the onions are very tender, pack the hot relish into three prepared pint jars, using a slotted spoon, leaving 1/2-inch headspace. Run a bamboo skewer or other thin implement around the inside edge of the jars to release any air pockets, and top up again if necessary. 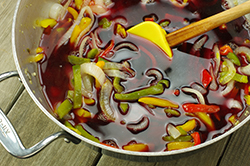 If there isn’t enough liquid to cover the relish, make up the difference with straight red-wine vinegar. Wipe the rims, seal, and process the jars in a boiling-water bath for 10 minutes. Allow to cure for at least a week before opening. Reprinted with permission from Saving the Season by Kevin West. Copyright 2013. Published by Alfred A. Knopf, New York, NY.